These pictures show the scale of a huge cannabis farm that has been found at a Sunderland house. Northumbria Police said it was called to an address in Cleveland Road in the early hours of Tuesday after being called by a member of the public who had seen a number of people, wearing balaclavas, leaving the property. The cannabis farm in Cleveland Road contained 300 plants and is said to be worth thousands of pounds. The masked men had left the front door of the property open, before getting into a vehicle and driving off in the direction of Chester Road. After noticing a strong smell of cannabis coming from the house, police were called out and discovered an industrial-scale cannabis farm which covered three floors of the property. Almost 300 plants thought to be worth thousands of pounds were found and later destroyed. Inquiries are ongoing. Sergeant Keith Goldsmith, of Northumbria Police, said: "This was a large-scale cannabis farm with hundreds of plants found in various stages of growth. Thankfully, we have now taken action to prevent criminals from making any further financial gain from this property. Some of the 300 plants found in the cannabis farm discovered in Cleveland Road. 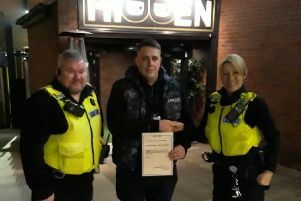 "These kinds of sophisticated operations often have links to organised crime and dangerous offenders, so it is important that these illegal drugs are found, destroyed and taken off the streets of Sunderland. "We also found that the electric had been bypassed at the address in a bid to avoid capture, and no doubt, a big energy bill. This is not only illegal but could have potentially fatal consequences for the occupants and those living in neighbouring properties. "This discovery was made possible because a member of the public saw something suspicious and contacted police. I would like to personally thank them for doing the right thing and picking up the phone. "Nobody wants to live next to a potential death-trap, as these farms can so often be. As a result, we would encourage anybody who believes somebody is using a property for this purpose to contact police." Police were called to Cleveland Road after people in balaclavas were seen leaving the property. Police said the cannabis farm covered three floors of the property in Cleveland Road. Inquiries into the cannabis farm discovery are continuing.